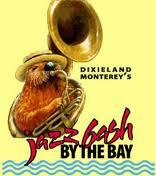 ONCE AGAIN, IT HAPPENS IN MONTEREY — the 2012 JAZZ BASH BY THE BAY is COMING! I know this is true from my one experience last year: I had a long session with the schedule and a highlighter, thinking, “I want to go here, but if I do that, I can’t go there.” We should all have such problems. Between 11:30 AM Friday, March 2, and late afternoon Sunday, March 4, you’ll have more than one hundred and sixty sets to choose from, from solo piano to the Royal Society Jazz Orchestra, and dance lessons from Dave & Linda Dance Company. Some of the other players and bands are John Sheridan, Katie Cavera, Eddie Erickson, Bob Draga, Hal Smith, Bill Allred, Doug Finke, Bob Schulz and his Frisco Jazz Band, Take Two, Old Friends, Reynolds Brothers, High Sierra, Marc Caparone, Hal Smith, Carl Sonny Leyland, Josh Colazzo, Mary Eggers, Virginia Tichenor, Titan Hot Seven, John Cocuzzi, Allan Vache, Ed Metz, Side Street Strutters, The Barehanded Wolfchokers, Yve Evans, Gonzalo Bergara, Jeff Barnhart, Anne Barnhart, Jerry Krahn, Tom Hook, Bill Dendle, Shelley Burns, Westy Westenhofer, Jason Wanner, Howard Miyata, Bryan Shaw, Mark Allen Jones, Frederick Hodges, Crown Syncopators Ragtime Trio, Chris Calabrese, Dave Gannett, the Rhythm Hounds, Grant Somerville, Reedley River Rats, Crazy Eights, Bob Phillips, George Young, Saxaphobia, Danny Coots (Musician of the Year at the festival, with good reason), sets of gospel music for Sunday, tributes to Bix, Nat Cole, Fats Waller, Harold Arlen, the washboard, Scobey and Clancy . . . duo-piano sets, lots of solo and group ragtime, and many surprises, as people sit in and have a good time, on and off the bandstand. Most sets run an hour, giving us leisurely mini-concerts. Children under 12 are admitted free with an adult, as are high school students with an ID. Discounted tickets are also available for college students, so if you have a music major in the house or just someone glued to his or her iPod oriPhone, the discounted tickets make a meaningful gift — perhaps the beginnings of a conversion experience. Dear grandparents who lament that the young people “aren’t coming to hear our kind of music”: now’s the time to take steps to reverse the trend! Jazz, like charity, begins at home. And 2012 promises even more! So — to refer back to a song performed by Clarence Williams around 1933 — I hope you’ll come over and say “Hello”! I’ll be juggling a video camera and a notebook. And I’ll be happy as the day is long.